This will guide you through the process of organizing your VODs by creating groups of videos. 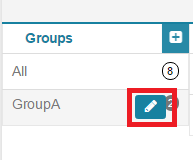 To create a new group, click on the blue cross button on the top right of the column. After creating your new group, you can simply select your videos then drag and drop them in the group.